This series is so addictive. I started reading The Heiress Effect because I needed an e-book to keep me occupied until I could get back to the paperback I was reading. But before I knew it, I was picking up my e-reader every chance I had, and just breezing through this book, page after page, chapter after chapter. By the time I finally put it down, on account of I needed to sleep if I didn't want to be a cranky co-worker, I was already about 69% complete. The second book to Courtney Milan's Brothers Sinister series was equally as enjoyable and readily likable as the first. There were, perhaps a few things about it that made me cringe, which was why I found that The Duchess War is still my favorite so far, but all-in-all, I pretty much loved, almost everything about The Heiress Effect. If the first book showcased how much I loved the hero, Robert Blaisdell, the Duke of Clermont, I believe that this second book showcased one of the most readily loved and awesome heroines in an historical romance I've read. Jane Fairfield, who can't do anything right, was superbly created as a character you love to love; in fact, I would love to be as open and "in your face" as Jane is, and not give another two-cent care about what anyone thinks. I love that she's so aware of herself, and I also love that she's not just pretending to fall on the unfortunate side of society's expectations; she truly doesn't know how to behave properly as a lady, and simply chose to multiply her effects by ten so that no one in polite society would even have a clue as to how to respond to her, or further humiliate her, since she's doing the job so nicely herself. In contrast, while I like Oliver Marshall, I can't say that I loved him all that much. He's a good man, caring about his family, with a conflicting guilty conscience that makes for great character development and self-revelation. I found it interesting that, while he's been fighting against the set standards of the aristocrats since he was young, he ended up slipping right into their games in his adulthood. That even though he's still mentally fighting them and proclaiming how he would use their own games against them so that he could gain power and win, he's still playing their games and compromising his own beliefs. Oliver came as a point of frustration for me on several occasions throughout the book, probably because, while I sort of understood his excuses and reasons... well, frankly, I didn't really understand them. If that makes any sense. For such an intelligent man, he was rather slow on the uptake sometimes. Meanwhile, there were some other characters that, while I didn't have any major problems with them, I did find some actions frustrating, and found myself wishing we would just get back to Jane and progressing her story line. Jane's sister, Emily's tangent was cute, but rather dull; however, the relationship between the sisters and their uncle, really DID put into perspective the hardships young girls went through when faced with a guardian like Titus Fairfield, what with all the quack medical experts he paraded into his home to "cure" Emily of her condition. Truthfully, I would have liked to get more into the girls' family back story about their father and mother, and how they came to be situated with such a holier-than-thou, stubborn, set-in-his-ways, and irritatingly dangerous uncle like Titus Fairfield. Such a "I'm your guardian and you'll do what I say because I know better than young girls, even against the presentation of logic." His racist imaginings and snap judgments at the end of the book were also unbecoming, and I would have liked to see him get his comeuppance, though I know it's probably not a necessary thread to explore. In contrast to Jane's sister, I actually found myself quite in like of Oliver's youngest sister, Free. She's fiery and independent and intelligent, and I can't wait to get to her story in Book #4 of the series! Finally, I'd say that a lot of the frustrations I had found in this book were quashed rather easily. Aside from our heroine, Jane, I also found the ending parts about Oliver's aunt Frederica a rather touching instance--we will recall the Marshall sibling's Aunt Freddy, as Serena's elder sister from the prequel novella, The Governess Affair, whom, suffering from a tragedy, has been unable to leave the confines of her home for almost the entirety of her adult life, all the way into old age. Anyway... I could spout things I love about this book all I want. I could say a lot of things and even points of frustration. 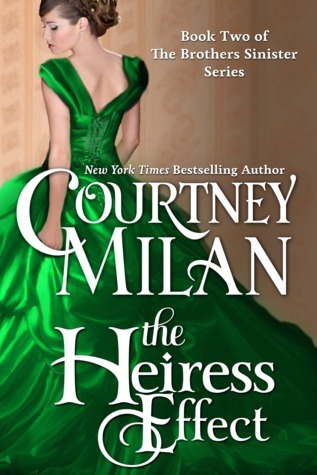 But ultimately, The Heiress Effect was simply an enjoyable book, and one of the few favorites I have read this year in 2017.